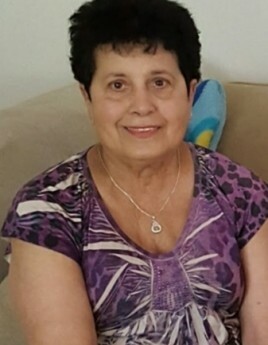 Rita Luz (Gonzalez) Platel, 80, passed away on Saturday, November 17, 2018 at Mount Carmel East hospital in Columbus, OH. Rita was born on Friday February 25th, 1938, to Manuel Gonzalez and Anna Albanese (Gonzalez) in Philidelphia, PA.
Rita retired from Anthem December 01, 1995. Rita was a lover of cats. She is survived by her three children Doreen Platel, Michelle O'Neill, and Edward Platel. Grandchildren, Christina (Richard) Dawkins, Ann Platel, Angi O'Neill, Keira O'Neill, Eddie (Christine) Platel, Charles (Amy) Platel, Jonathan Platel, Joe Platel, Donyell Platel. Great Grandchildren; Richard Dawkins III, Christopher Dawkins, Royce Dawkins, Andreas Ward, Angelus Seams, Karma Mackey, Kason Thompson, Kashis Thompson, Kassia Thompson, Ann Platel, and Kylie Valdez. Along with numerous other great grandchildren. Preceded in death by ex-husband Edgar Charles Platel. A Mass of Christian Burial will be held on, December 5, 2018 at Saint John XXIII Parish, 5170 Winchester Southern Road, Canal Winchester, OH 43110. Visitation will be held from 10:00 AM to 11:00 AM, and the mass will be held from 11:00 AM to 12:00PM. Burial will be held at 12:00 PM Monday December 10, 2018 at Cedar Hill Cemetery in Philadelphia, PA.